1. Enter the points (x, y, and z). 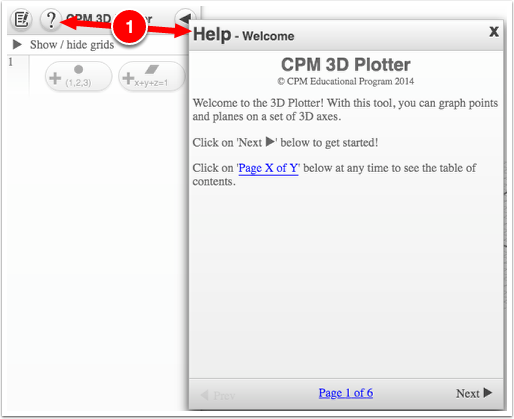 Click on the point plotter button to add a point. Click on the (x, y, z) coordinates. Type or click the '–' and '+' to modify the coordinates. Click the trace button to view the path. 2. Enter the coefficients of an equations in the form: ax + by + cz = d.
Click on the plane plotter button to add a plane. Click on the equation to view the variables and constant. Type or click the '–' and '+' to modify the coordinates for the variables and constant. 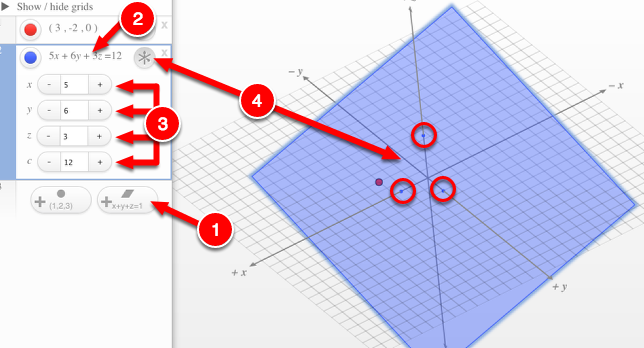 Click the intersect button to view the point the plane crosses the x, y, & z axes. Change colors of the points and plane. Click and hold on the colored buttons to view the settings. Add description, clear or save your work. 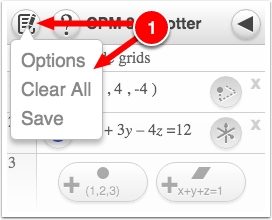 Click the Pen & Paper icon and select Options, Clear All or Save. Options - Add Title and Description of your work. Clear Tiles - This will remove all the points and plane. Find more information in the the help (?) button. Click ‘?’ to view Help window.